The Luck is a glass beaker, with blue, green, red and white enamel and gilding, in a case bearing the initials, ‘IHS’ – the Greek rendering of Jesus. 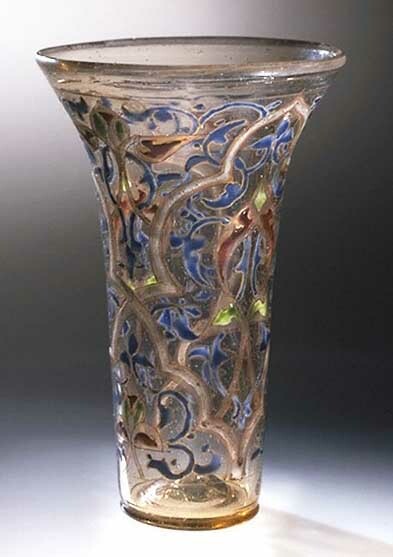 The glass is believed to be of Syrian or Egyptian origin, and it was made some time around the 13th or 14th century; a similar one was gifted to the Cathedral of Douai in 1329. The combination of location and date strongly suggest that the glass was brought back from the Crusades. The Musgraves referred to the glass as their ‘Luck’ at least as early as the 1670s, although a later Musgrave, Sir William, stated in the Gentleman’s Magazine of 1791 that it had been in family hands since the 15th century – the date of their arrival in Edenhall. Despite the nigh-on guaranteed link with a crusader ancestor, by this date, faeries were in the frame (as they so often are in Cumbria!). Stories of the theft or gift of faery vessels are not uncommon throughout northern Europe. So, what happened to Edenhall? In 1926, the Luck was sent to the Victoria & Albert Museum, still intact, and it is still there. In 1934, the house at Edenhall was demolished. The Luck of Muncaster – a vessel given to the castle by Henry VI in 1463. The Luck of Burrell Green, near Great Salkeld, dated to c.1417. The Luck of Workington – a gift from Mary, Queen of Scots, to Sir Henry Curwen in 1568. The Luck of Haresceugh Castle, near Renwick – both vessel and castle have vanished. The Luck of Nether Haresceugh – recently still intact. The Luck of Skirsgill Hall – just dated to 1732: perhaps they heard about Edenhall! The Luck of Rydal Hall – dated to 1736 – ditto. See http://collections.vam.ac.uk/item/O3311/beaker-and-case-the-luck-of-edenhall/ for the Victoria & Albert Museum’s entry on the Luck of Edenhall. They have the vessel on display. This entry was posted in Folklore of Cumbria, Folklore: Faeries, Folklore: Magical, History of Cumbria, History: 19th century, History: Medieval, History: Unburied treasure and tagged cumbria, cumbria faery, cumbria fairy, cumbrian folklore, cumbrian history, Cumbrian history and folklore, eden valley history, lake district folklore, lake district history, luck of edenhall, musgraves of edenhall, penrith history. Bookmark the permalink. Just found maybe the first literary reference to the Luck of Edenhall. This is from the 1816 novel Brougham Castle by Jane Harvey, a Newcastle author. “Whae said your aunt Kitty was a witch?”, interrupted she, with a look of scorn. “You may flyre an’ laugh,” she added, with increased asperity, “but your aunt Kitty’s seen fairies plenty. Didn’t she say she heard then clap their claise i’ t’ hills at Aldston ? didn’t my mudder see them dance on t’ green? you’ve seen the fairy’s glass at Edenha’ yourself. Cyrus,not less interested in the biography of the fairies than he had been in Hercules, now quitted the side of Crosthwaite and stationed himself by that of his wife, listening with profiound attention to the accounts which she gave of numberless children having been, to her knowledge, stolen by pigmies. Gothic Heroine, you are a star! I suspect the novel may not have been entirely serious even in 1816 – !